ZIMBABWE’S Chevrons, who do not have a coach at the moment, will tour South Africa for a limited-overs series scheduled for September-October. The two sides will face each other in three One Day International matches and as many Twenty20 international (T20I) games. The tour will start with the ODI series, which is set to get underway in Kimberley on 30 September. Bloemfontein will host the second ODI on 3 October, with the third and final match of the series pencilled in for 6 October in Paarl. The T20I matches will be played in East London (9 October), Potchefstroom (12 October) and Benoni (14 October). Before touring South Africa, Zimbabwe will host Australia and Pakistan in a triangular T20I series, followed by a five-match ODI series with Pakistan. 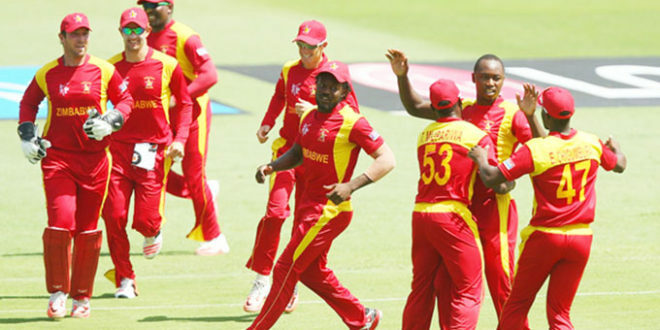 The Chevrons have been without a coach since Zimbabwe Cricket authorities parted company with Heath Streak after the disappointment of a failed ICC Cricket World Cup Qualifying battle at home. Needing just to beat UAE to make it to the World Cup, the Chevrons came short, before the biggest crowd to watch a cricket match in this country, and fell by three runs. 14 October: Third T20I (Benoni) – zimcricket/Sports Reporter.